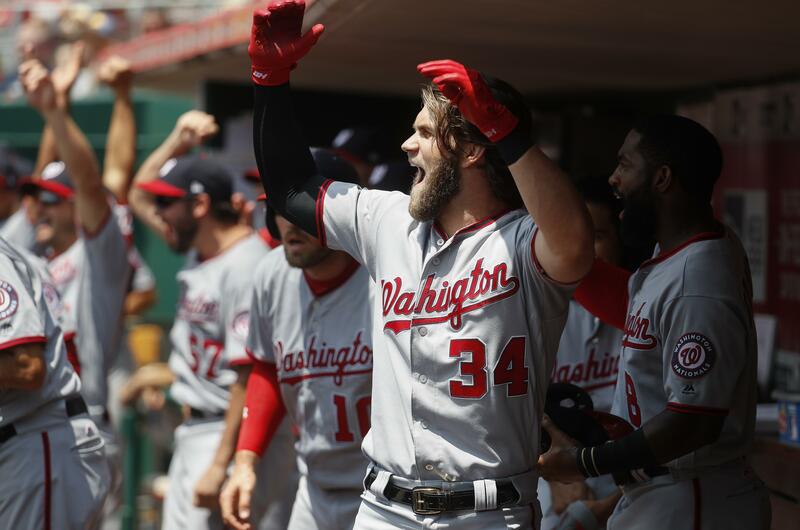 Mon., July 17, 2017, 10:20 p.m.
Ryan Zimmerman set the Nationals’ career home run record with a solo shot, and Bryce Harper connected again as the Washington Nationals powered their way to a 6-1 victory over the Cincinnati Reds on Monday night for a four-game sweep in Cincinnati. Zimmerman’s 235th career homer moved him ahead of Vladimir Guerrero for most in Expos and Nationals history. Stephen Strasburg (10-3) recovered from his shortest start of the season by fanning 11 in seven innings and allowing four hits, including Eugenio Suarez’s homer. Scott Feldman (7-7) lasted only one inning. He gave up a double, a single, Harper’s three-run homer and Zimmerman’s solo shot in his first 12 pitches. Feldman left after facing nine batters and giving up five runs on 33 pitches. Mariners 9, Astros 7 (10): In Houston, Kyle Seager and Danny Valencia hit back-to-back homers in the 10th inning to lift Seattle over Houston in Houston. The wild back and forth game was tied at 7 entering the 10th when Seager, who finished with three hits, connected off Tony Sipp (0-1) on a shot to the seats in right field. Valencia added an insurance run when he launched a slider to center field three pitches later. Mike Zunino and Nelson Cruz also homered for the Mariners as they tied a season high with four homers to win their fifth straight game. Yovani Gallardo (4-7) allowed two hits in a scoreless ninth for the win and Edwin Diaz struck out two in a scoreless 10th for his 17th save. Cruz tied it in the seventh and Zunino put Seattle on top with his homer in the eighth. A sacrifice fly by George Springer scored a run to tie it at 7-7 in the bottom of the eighth. Jake Marisnick and Carlos Beltran both homered for the Astros on a night when All-Star shortstop Carlos Correa left in the fourth inning after jamming his left thumb on a swing. Twins 4, Yankees 2: In Minneapolis, Eddie Rosario had two RBI doubles and Eduardo Escobar added the go-ahead, pinch-hit single in the eighth inning to help Minnesota over New York. Brian Dozier had two hits and Adalberto Mejia gave up one run and struck out four in 5 1/3 innings for the Twins, who were tied 2-2 when Escobar delivered a base hit to left field off left-hander Caleb Smith (0-1). Rosario followed with his second double of the game, and Brandon Kintzler picked up his 26th save as light rain turned into a steady downpour at Target Field. Yankees star slugger Aaron Judge went 0 for 3 with an intentional walk and is 1 for 21 since his electric performance in the All-Star Home Run Derby. Taylor Rogers (5-1) pitched 1 1/3 innings of scoreless relief for the win. Cubs 4, Braves 1: In Atlanta, Jon Lester (6-6) bounced back from the shortest start of his career by allowing only one run in seven innings and Chicago stopped Atlanta’s ninth-inning comeback. The Cubs led 4-1 before Atlanta scored two runs in the ninth off closer Wade Davis and loaded the bases with two outs. Davis allowed one-out singles to Brandon Phillips and Freddie Freeman before Phillips scored from third on a wild pitch. Matt Kemp followed with a run-scoring single and pinch-runner Lane Adams stole second and moved to third on Tyler Flowers’ flyball to the warning track in center field. Following an intentional walk to pinch-hitter Matt Adams, pinch-runner Dansby Swanson stole second, leaving runners on second and third. Davis walked Sean Rodriguez, playing in his first game of the season, to load the bases. Johan Camargo’s fly ball to shallow left ended the game, giving Davis his 18th consecutive save this season. Julio Teheran (7-7) allowed two runs and five hits and four walks in six innings. Blue Jays 4, Red Sox 3: In Boston, Steve Pearce hit a solo homer, then added the go-ahead single in the eighth inning in Toronto’s victory over Boston. The Blue Jays led 3-0 after two innings but Boston scored three in the seventh. Toronto went back in front in the eighth when Pearce singled to score pinch-runner Ezequiel Carrera from third. Ryan Tepera (5-1), who started the eighth, was credited with the victory even though Leone was the pitcher of record when the winning run scored. Baseball rule 9.17 (c) instructs the official scorer not to award a victory to a reliever who makes a short, ineffective appearance. Roberto Osuna pitched the ninth for his 23rd save. Heath Hembree (1-3) took the loss. Rockies 9, Padres 6: In Denver, Charlie Blackmon`s fourth leadoff homer of the season hit the facing of the third deck, hard-throwing rookie German Marquez tied a career high with nine strikeouts and scuffling Colorado beat San Diego. Trevor Story added a two-run double as part of a five-run third to help the Rockies win back-to-back games for the first time in nearly a month. Marquez (7-4) allowed three runs over 6 2/3 innings. He perplexed the Padres by effectively mixing in his curve with a 98 mph fastball. Greg Holland got Matt Szczur to ground out following a two-out double in the ninth to earn his 29th save in 30 chances. San Diego starter Luis Perdomo (4-5) had his three-game winning streak halted after surrendering seven runs, five earned, over 2 1/3 innings. Tigers 10, Royals 2: In Kansas City, Missouri, Nicholas Castellanos and Mikie Mahtook went deep, Jordan Zimmermann smothered the Royals with strikes and Detroit proceeded to trounce Kansas City to open a four-game series. Ian Kinsler added three extra-base hits for the Tigers, who knocked American League wins leader Jason Vargas (12-4) from the game after 2 2/3 innings in his first start since the All-Star break. Zimmermann (6-7) allowed one run and seven hits without a walk in 6 2/3 innings, throwing 79 of 97 pitches for strikes. His dominance was partly a result of first-pitch strikes to 24 of the 28 batters he faced, which helped the right-hander win for the first time since June 3. Pirates 4, Brewers 2: In Pittsburgh, Gregory Polanco doubled twice, drove in two runs and threw out a potential go-ahead run at the plate to lead surging Pittsburgh over Milwaukee. Brewers catcher Stephen Vogt left the game in the fifth inning after a collision with Pirates pitcher Chad Kuhl at the plate. Vogt caught an incidental elbow to the head from Kuhl, and both players were down for several minutes. Kuhl remained in the game, but Vogt had to be helped to his feet and left to be evaluated for a neck strain and left knee strain. Vogt held onto the ball and Kuhl was called out. Polanco finished 4 for 4 and is hitting .446 this month. Francisco Cervelli added two hits for the Pirates, who pulled within six games of the first-place Brewers. Daniel Hudson (2-4) picked up the win in relief of Kuhl when Polanco nailed Manny Pina at the plate in the sixth to preserve a tie. Polanco drove in Josh Bell in the bottom of the inning off Josh Hader (1-1) to put the Pirates in front. Felipe Rivero retired the last four batters for his seventh save. Cardinals 6, Mets 3: In New York, Paul DeJong homered against New York for the fourth straight game and Adam Wainwright hit an RBI double while winning his fourth consecutive start. With runners at the corners in the bottom of the ninth inning, slugger Yoenis Cespedes grounded into a game-ending double play on a 3-0 pitch from Brett Cecil. Tommy Pham capped a six-run sixth with a three-run homer on Hansel Robles’ second pitch since returning from the minors. Michael Conforto and Lucas Duda homered off Wainwright (11-5), who beat scuffling starter Zack Wheeler (3-7) for the second time in 10 days. Orioles 3, Rangers 1: In Baltimore, Seth Smith hit a tiebreaking homer in the seventh inning and Baltimore used a strong performance by its struggling pitching staff to beat Texas. Smith connected off Andrew Cashner (4-8) to make it 2-1, Baltimore’s first lead since the All-Star break following a three-game sweep by the Chicago Cubs. Chris Tillman allowed one run and two hits over six innings. Richard Bleier (2-1) pitched a scoreless seventh, Mychal Givens had a perfect eighth and Brad Brach completed the three-hitter for his 16th save. Marlins 6, Phillies 5 (10): In Miami, Giancarlo Stanton homered twice and Dee Gordon hit an RBI single with two outs in the 10th inning that sent Miami over Philadelphia. Gordon lined a single to right-center off Mark Leiter Jr. (1-2) for the Marlins’ fourth walk-off win of the season. Drew Steckenrider (1-1) pitched a scoreless 10th. Rays 3, Athletics 2: In Oakland, California, Jake Odorizzi and two relievers combined on a two-hitter, and Tampa Bay beat Oakland. Steven Souza hit his 19th home run, Evan Longoria also went deep and reached base three times while Adeiny Hechavarria added two hits for the Rays, who won for the third time in four games since the All-Star break. Odorizzi (6-4) bounced back from his worst start of the season and went seven innings while striking out five and walking two. He gave up his lone hit when Khris Davis hit his 26th home run in the fourth but was otherwise dominant while not allowing another runner past first base. Tommy Hunter pitched the eighth and Alex Colome retired three batters for his A.L.-leading 27th save. Oakland pulled within 3-2 in the ninth when Yonder Alonso doubled, took third on a groundout and scored on a wild pitch. Colome got Ryon Healy to ground out to end the game. Indians 5, Giants 3: In San Francisco, Josh Tomlin struck out five and pitched into the eighth inning to win back-to-back starts for the first time this year, and Cleveland capitalized on two costly errors to rally and beat San Francisco. Tomlin (6-9) allowed six hits and three runs without walking a batter in 7 1/3 innings. Cleveland snapped a season-high four-game skid with its first victory against the Giants in the last seven tries. Published: July 17, 2017, 10:20 p.m.